Born in Boston, Principal Conductor and Interim Artistic Director Peter Leonard has led recent Opera on the James productions of Carmen, Così fan tutte, Don Giovanni, Falstaff, Le nozze di Figaro and Rigoletto. His next production in Lynchburg will be La Traviata in the first opera performances at the newly restored Historic Theatre in the Academy Center for the Arts. 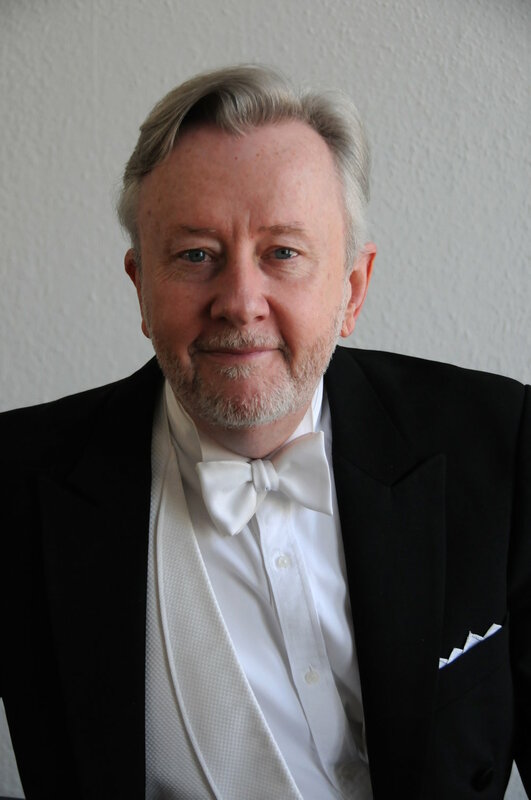 Mr. Leonard has lived and worked extensively in Germany, holding positions as both Music Director and Intendant (General Director). His first European post was a distinguished seven-year tenure as General Music Director of the City of Augsburg, Germany. During this time, he presided over world and German premieres of both opera and symphonic repertoire, highlighted by a path-breaking new production of Wagner’s Der Ring des Nibelungen. Recent guest conducting appearances have included a new production of Aida with the Belgrade National Theatre; Eugene Onegin at Chautauqua Opera; concerts at Berlin’s Classic Open Air Festival on the Gendarmenmarkt; Elijah with the venerable Berliner Singakademie at the Konzerthaus Berlin; Marble City Opera’s Postcard from Morocco and Sweets by Kate; and L’incoronazione di Poppea and Die Fledermaus with Berlin Opera Academy. As General Music Director and Chief Conductor of the North German Philharmonic and the Volkstheater Rostock, he increased concert ticket sales by over 20,000 in one year. One of the many new projects he started there was “Wagner on the Baltic,” dedicated to the advancement of the art of singing this most demanding repertoire. To bring music to more young people, he secured major corporate funding in order to realize his dream of concertizing for an under-served age group through a new series of “Concerts for Teens.” Through a range of stimulating crossover collaborations, Peter Leonard raised the visibility as well as the stylistic flexibility of his orchestra. Following his accomplishments as Music Director, he was elevated to the position of Intendant (General and Artistic Director) of all divisions of the organization: orchestra, opera company, spoken theater and dance. With an annual budget of 18 million Euros, he led over 300 employees presenting over 800 performances per year. Peter Leonard has guest conducted orchestras throughout North America, including the New York Philharmonic and the orchestras of Alabama, Dayton, Edmonton, Florida, Jackson, Nashville, New Mexico, Rhode Island, Spokane, Tucson, West Virginia and Winnipeg. He has guest conducted many German orchestras, including those in Aachen, Augsburg, Bremerhaven, Dessau, Frankfurt, Hagen, Heidelberg, Herford, Hof, Kaiserslautern, Karlsruhe, Konstanz, Lübeck, Rostock, Siegen, Solingen and Suhl. Other international appearances have included Mexico City’s famed Orquesta Filarmonica de la UNAM, the Belgrade Philharmonic, Sarajevo Philharmonic and the Pusan Philharmonic. An active opera conductor, Peter Leonard has led a particularly broad range of repertoire. The success of his Augsburg Ring led to an invitation to lead that work in Stuttgart at Germany’s “Opera House of the Year” (Opernwelt). His insightful interpretation of the core German repertoire has led to similar engagements, conducting works from Mozart to Weber to Richard Strauss to Hindemith and Berg. His love for singing and singers informs every moment of his work, so that his interpretations of the Italian masters (especially Verdi and Donizetti) have been particularly prized. To great critical acclaim, he also led the world premiere of the complete version of Bohuslav Martinů’s pathbreaking “film opera” Les trois souhaits. Among the many composers whose music Mr. Leonard has premiered are Copland, Crumb, Egk, Finney, Holst, Hovhaness, Korn, Kreisler, Martinů, Maw, Pasatieri, Rorem, Russman, Thomas, Thorne, Wilder and Zwilich. A gifted speaker, Peter Leonard also offers insights on business and life issues, viewed through the lens of fine art. As Music Director of The International Forum, a prestigious business consulting firm, he has presented courses in “Leadership Through Music,” a hands-on experience focused on the relevance of great music to everyday life. Fluent in the German language, he has spoken on this subject at Baden-Württemberg’s Hochschule für Wirtschaft und Umwelt, as well as at Dartmouth College’s Tuck Executive Education program and for Toronto’s Verity. When appointed Music Director of the Shreveport Symphony Orchestra – an acclaimed tenure that would last 11 seasons – Peter Leonard held a concurrent post as Music Director of the Youngstown Symphony Orchestra, continuing as Music Advisor. He was also Conductor-in-Residence of The Louisville Orchestra, during which time he led more than half of the orchestra’s programs, appearing concurrently as Principal Conductor of the Super Pops series. He also revitalized The Louisville Orchestra’s reputation in contemporary music through new commissions and the institution of a Festival of New Music. During his leadership, The Louisville Orchestra won the coveted ASCAP Award for programming excellence. As Music Director in Shreveport, Peter Leonard introduced a new dance/live music subscription series, a weekly series of public radio broadcasts, an expanded chamber orchestra series, a concert preview series and increased area touring as well as frequent collaborations with other groups in the region. Recognizing these accomplishments in artistic leadership, the city of Shreveport named April 6, 1989 “Peter Leonard Day.” Mr. Leonard has also received a National Arts Associate Award from Sigma Alpha Iota sorority for his musical achievements. Peter Leonard has recorded for Albany, CRI, Opus One, Painted Smiles, Premiere Recordings and The Louisville Orchestra’s First Edition Records. These disks include several premiere recordings, including the Pulitzer Prize winning Air Music by Ned Rorem. After his teen years as French hornist (Principal Horn, New England Music Festival; Greater Boston Youth Symphony Orchestra) plus five summers at Tanglewood, Leonard moved to New York to study at The Juilliard School, earning both Bachelor’s and Master’s degrees. He was chosen by the celebrated Jean Morel for the school’s highly selective conducting program. He was given fellowship awards for a variety of performance and recording projects, and was the recipient of prestigious awards for advanced study at the Aspen Music Festival, Salzburg’s Mozarteum, Tanglewood and Bayreuth.